Combatting gender inequality in the workforce starts with changing perceptions in college. It was Jeopardy, and I was—contrary to what the question may suggest—in a meeting for an investment club. We were welcomed into the spring quarter with a review game to refresh our memories about techniques and tactics for valuing a company. Questions were fired at us about FCFs, the acquisition of a media conglomerate, and ratios for REITs. The atmosphere was competitive, the questions were hard, and the game was exciting. As we were nearing the end, a final question popped out. Eyes turned to me, and I self-consciously remarked that I didn’t know. Was I supposed to know? Why would my teammates not enlist my help for the five technical questions, three M&A questions, and four current news questions, but would for the mock question about Justin Bieber? It’s obvious. As a millennial girl, I should be most attuned to this boy’s career. But the problem is not merely that my male teammates assumed I knew the answer to a pop culture question, but that society’s perception of gender has remained unchanged. Less than 10 percent of all U.S. fund managers are women, and women exclusively run about 2 percent of the industry’s assets and open-end funds. By contrast, men exclusively run about 74 percent of the industry’s assets and 78 percent of funds. What is so distressing about this discrimination, however, is that in the face of such a pessimistic statistic, women are blamed for it. Supposedly we shy away from math, we are ruled by emotions, and we cannot make decisions. We don’t deserve to manage a portfolio; we should just leave it to the men, who make the decision 98 percent of the time anyway. 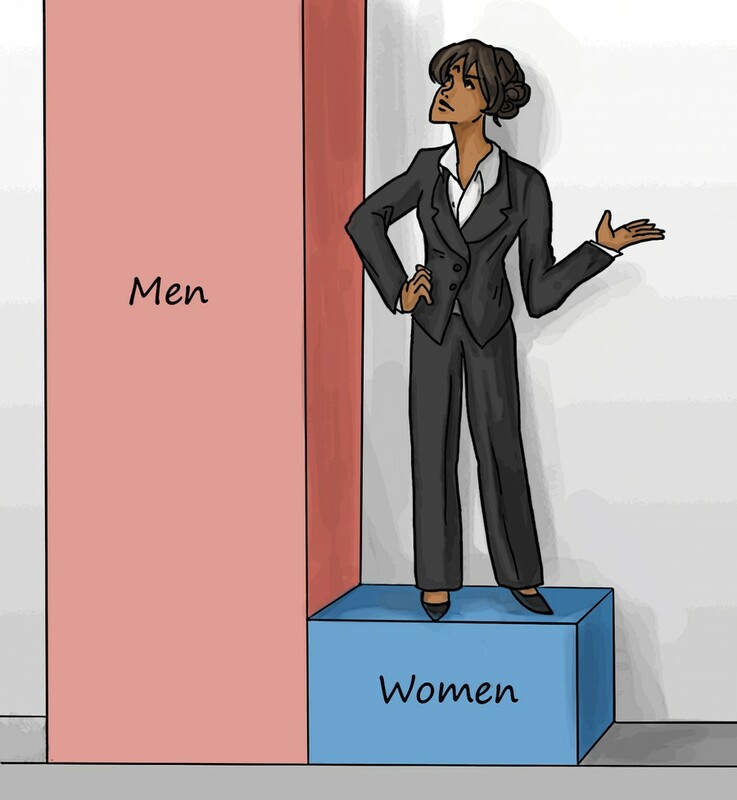 What is so distressing is that articles from Bloomberg View’s “Where Are the Women in Finance” to The Wall Street Journal’s “The Price Women Pay For Not Being Confident,” in an effort to expose this imbalance, still attribute the underrepresentation to us. They say that women are not successful because they lack confidence. They argue that women hold only 2 percent of CEO roles in the finance industry because they are not present in the field in the first place. Despite what these sources may have you believe, the problem isn’t that women are somehow unsuited for business careers. It is that college—the bedrock of the American Dream, and the great equalizer—is not doing its job. Why are women not confident about their knowledge of financial markets and investing? Why have we held only 14.3 percent of executive officer positions, and why has this statistic not changed for three consecutive years? It is not that we are any less knowledgeable, any less ambitious, or any less effectual. It is that we are perceived and treated as such. It explains why I should be more competent in pop media than in valuation techniques, why there is a severe lack of women in finance-oriented clubs around campus, and why even though women represent 60 percent of all financial services employees, they hold only 14 percent of board seats. This inequality has been acknowledged, but we’re still far from a substantive solution. For every relevant statistic about gender imbalances, RSOs targeted at women empowerment are created, programs designed to give women an advantage are made, and articles exposing these issues are written. I should not, then, be able to say that in this year, there are only 20 women chief executives of S&P 500 Companies, down from 24 in 2015. I should not be able to say that the percentage of women holding board seats has remained stagnant at 14 percent for seven consecutive years. Why can I say this? The programs, articles, and clubs, in exposing a branch, bury the roots. By making hollow promises of change, they inadvertently avoid the main issue: society’s perception of women. Before these programs, articles, and clubs can even begin to address deeply rooted inequality, they need to combat its cause. A statistic is not a disease: it is only a symptom of a larger, systemic problem. We need to start with college, a supposed foundation of equality. We need to start with college, so that when someone asks what the name of Justin Bieber’s new album is, a woman is not expected to know. The hope is that when we play Jeopardy again, our team trusts us to say that Price/FFO and EV/EBITDA are a few of the metrics to value REITS, because no, we don’t all know what Justin Bieber’s new album is called. The hope is that when a question is asked, eyes will turn toward men and women alike for an answer. Jasmine Wu is a first-year in the College majoring in economics and philosophy.